Just don't call me late for dinner. I've fallen for the latest advertising campaigns for the Venus Embrace razor. Love may be blind, but it ain't cheap. Holy moly. I would almost expect the thing to hop up, lather my legs and gracefully glideitself through the jungle all on it's own, for what I paid for it. But, alas. It's not to be. (or is it? there are so many ways I could go with this. But, I won't). Now, this beauty gives and incredible shave. So much so, that I would like to use it every day, but the cost of replacing the blades that often- well, it goes against my plans to do things like feed my children and keep the lights on. But, not to despair! There is an answer to my dilemma. No, not that kind of alcohol. I mean, I'd be silly to drink and then shave right? Wouldn't that be a SUI? (And with the size of my calves, SUI, SUI pig pig pig ... wouldn't be too far wrong). The thing that dulls the razor blade the fastest is moisture. So, by simply dipping the razor blade in alcohol after using it, then drying it off your blades will last a considerably long time! And then, Venus and I will live happily, hairlessly ever after. For more Works for Me Wednesday tips, visit Shannon at Rocks in my Dryer. Works for Me, well, Saturday. Why? 'Cause it's just that important. If you read here often, you know that pretty well. Honestly, I don't like to cook, because, well, it scares me. I never really learned how to cook so it's all foreign to me. Like a bad Japanese movie. Speaking of which, don't get me started on sushi. Anyway - I do like to eat out. I'm real good at navigatin' a menu. And not havin' to cook. Come by, sometime. I'll prove it. The problem is, well, eating out is ... ex. pen. sive. Especially now that we've reached the golden age between Happy Meals and Kids Eat Free night and the Senior discount. It's called "Wehavetwiteenagers" syndrome. Insurance doesn't cover it. They really should. I mean, it's contagious. First one gets it, then the others do. One by one. It's ridiculous. There's an answer to our little dilemma. It’s so easy. Just use our search to find a restaurant. Many of our participating restaurants have different offers, so pick the place that suits you best. We provide handy descriptions and even menus to help you decide. Follow the instructions for purchasing a gift certificate and print it out. In minutes you're all set for a night out for less! It's three simple steps. Three! First, search your area, or the area you want to eat in by city and state, or zip code. Last, you buy a $ 25.00 gift certificate. Did you catch that! $25.00 buckaroos o'food for TEN dineros!!! A savings of 15 buckaneros! If you join Restaurant.com (which is FREE! FREE I TELL YOU) they will send you emails with specials! For more SAVINGS!!! Like this one! That came today! Right now and through this Wednesday, use the code GOURMET at checkout in the promo box and save 70%!!!! That's a $ 25.00 gift certificate for only $3.00! The gift certificate's are good for a a year, so stock up! And, you can give them as gifts! So, give it a try. You got nothing to lose. Summertime is approaching, which means I DON"T WANT TO USE THE OVEN. See ya in the fall, baby. Don't let the potholder hit you on the way out. Around here summer means lots of cold sandwiches, and easy fixin's off the BBQ. The thing that COOKS OUTSIDE! and DOESN"T! HEAT! UP! MY! HOUSE! and HUBBY! IS! RESPONSIBLE! FOR ! CLEANING! I like to have easy, throw together side dishes on the cheap and this is one of my favorites. Let's call it Marie's Easy Peasy Coleslaw, shall we! (Get a pen and paper, you may want to take notes). 1. Get two bags of pre-shredded cabbage from the refrigerated produce section at the store. 2. From the same refrigerated section of the produce area, grab one bottle of Marie's Coleslaw dressing. 4. Get a bowl and dump it all in. For more great recipes. 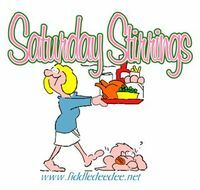 visit Fiddledeedee's Saturday Stirrings. Will We Rise to the Challenge? A child, or a family in Africa receives a mosquito net. Malaria has to take a step back. (I've witnessed the effects of this awful disease first hand. My dad contracted malaria as a child in Louisiana. How easy is this, to be a blessing? Friday is World Malaria Day. I'm challenging each of you to get involved. It's a one time thing. Less than the cost of feeding a family of 4 at McDonalds. Less than the cost of a week's worth of Starbucks. I'd love to see 10 readers of Living In Grace commit to the Challenge. That's 10 children or families touched. Just click on the "Bite Back" graphic above for all the details. And be sure to come back and leave a comment after you do! Are we in a parallel universe? Brooke and Jason are safe? Carly and Syesha were in the bottom two? Maybe tonight's episode was the Idol Bloopers Special. I have two kids who homeschool online, and a husband who works from home online. And I blog. Online. And read blogs. Online. That means a total of four computers. Up until now, we've been able to force ask the kids to share a computer. Up. until. now. However, we've now had to drag out 'puter numero quatro for Kati. Problem is, it had no working monitor. And for some reason, the little whiner thinks she needs to actually have one of those to see what she's doing. We are in no position to go out and buy her a new monitor, and the thought of getting one child up before dawn to be done with their homework so the other can get started? We are not morning people, people. So, I turned to my new best friend freecycle.org. "It's a grassroots and entirely nonprofit movement of people who are giving (& getting) stuff for free in their own towns. It's all about reuse and keeping good stuff out of landfills. Each local group is moderated by a local volunteer (them's good people). Membership is free." It's like craiglist, but better! Instead of advertising things for sale, you list things you either "want" or "don't want" that are free! It's amazing the things that are listed. We have gotten rid of moving boxes galore and some other odds and ends that would normally go to charity, and after listing that we needed a working computer monitor ... VOILA! within 24 hours I had three people email me iwth offers to give me one of theirs they no longer needed! On Saturday, we drove over and picked up a nice little monitor for Kati and now she is all set. Freecycle is organized by geography, so you're advertising to those in your local area. I encourage you to give it a try. For more Works for Me tips, visit Shannon at Rocks in my Dryer! Are you really another year older today? It seems like yesterday, I was waddling around with a 14 month old anticipating your arrival. Would I have enough love for both of you? Could I share myself with two babies? I remember the day I found out you were a boy. Because of my health issues, I had ultrasounds once a month. Every month, the tech swore fives ways to Sunday you were a girl. Every time. Then, at 8 and a half months- a new tech announced "Congratulations! It's a boy!" When I called your dad to tell him, he was elated, but could hear the fear in my voice. I knew nothing about raising a boy. I felt like a complete and utter failure as a mommy for feeling that way. Funny thing, though, I should have known you were a boy. With Kati, we could only think of girl's names. With you, only boys. I loved that name. always. I knew that it was a special name, meant just for you. When I Was a couple of weeks away from having you, a dear friend was murdered in his driveway. A robbery. He left behind a legacy of faith in his wife and two sons. And that is how you got your middle name. To honor his memory. The night before you were due by c-section, I felt sick to my stomach. I was thought they would surely skip the surgery and make me wait. I was sooooo ready to be done. I wanted to meet you. Hold you. Get to know you. The morning of the surgery, we packed up and went to the hospital. after being hooked up to the monitors, the nurse announced I was in labor... Funny. I didn't feel a thing. Not a twinge, a pain. Nothing. What she didn't tell us, was that I was in "pushing labor". Had I not been scheduled that day, the doctors were convinced I would have just dropped you at home. Without warning. We didn't realize you were crowning until it was too late. So, one doctor had to push you back up and in, while the other pulled you out through the incision in my belly. They said it was a first. At that moment, I knew you would do things on your own time, ahead of the curve. And you haven't disappointed. You've walked at 4 months, crawled at 5 months and ran at 7 months. You never "walked". When you started speaking sentences at 17 months, we knew we were in for a ride. You've been full of questions since that day. Always curious, always learning. Talking is like breathing. Without it, you wouldn't survive. I truly believe God gave you more words, and you're determined to use them up. Every day. Without fail. I've learned so much watching and listening to you. Your plans to join the Air Force worry me, but I'm proud. You follow in the footsteps of your grandfathers, and your daddy. Your desire to be a doctor, and help others, makes me proud. I'm excited to see how you do in JrROTC next year. Excited to see you grow, become a leader. But, I also celebrate that you still run to make sure I have a huge hug before I leave anywhere, or go to bed at night. That you hold my hand when we walk through a parking lot. That you open doors for people. And say "thank you". You name means "Jehovah's Gift". Truly, you are a gift to our family. Thanks for being my boy. In a pinch, ok, when I'm too lazy to go to the store and we've run out everything in the house ... this is one of my go-to meals. I always have everything in the house to make them, and these seem to be lighter and yunnier than most waffle recipes I've tried.. If you can, throw some eggs together, in whatever style you like, and enjoy! Combine wet ingredients and whisk well to combine. Sift dry ingredients into a large bowl and form a well in the center. Add the wet mixture to the well and fold in with the dry. Don't worry if there are a few lumps. When iron is hot, spray lightly with non-stick spray. Spoon 1/2 to 3/4 cup of batter onto the center of the iron and cook until a golden brown crust forms (about 5 minutes). Heat the oven to 220 degrees, and put the waffles on an oven-proof plate for warming while you finish cooking the batch. I serve with eggs and whatever fruit we have laying around. Easy peasy! For s'more great recipes, visit Fiddledeedee's place! For those of you new to the blog, I've been sitting on the Wait List for Kidney with Denver Porter Adventist Hospital for just over a year now. And, just in the last few weeks have been trying to get things moving to double-list at the Mayo Scottsdale Clinic here in Arizona. Long, long, long story short ... we had been assigned to a coordinator that, well, didn't seem to move. She didn't move slow-ly, she just didn't move. It's a complicated process getting listed. First, you need a referral from your specialist. Check! Then, she needed height and weight for qualifying. Check! Next, we went through paperwork galore ... history, insurance, blah blah blah .... Check! Then, we were supposed to hear about coming in for a week long evaluation. I said, next, we were supposed to hear about coming in for a week long evaluation. Several phone calls were made. Several voicemails were left. Several weeks passed. Finally, I called and asked for a new coordinator, and explained my sob story to the poor girl who answered the phone. She couldn't promise me anything, but thought she would see what was up. When she called back 10 minutes later, she had been told they were waiting for insurance clearance. 6 weeks? For the insurance to clear? Bzzzzzzzzzz. Wrong answer. Thanks for playing. I now have insurance approval. a sweet new coordinator named LeAnn, and all the required tests that Denver has in their possession is being sent to Mayo. Once received, it should cut my stay there for evaluation from a week to three days- Hurray!!! The best news is, that once listed and confirmed, we FINALLY get to start testing living donors! The moment we have ALL! BEEN! WAITING! FOR! Mayo has an extensive cross matching program, so my chances of getting a donor are greatly increased with them! We aren't constrained, so much, by blood type!!! IMPORTANT: If you have expressed interest in being a living donor, or would like to be considered :) ... and are willing to come to Scottsdale, AZ for surgery if you are THE match ... we will need to have you contact Mayo directly for their living donor packet. Feel free to shoot me an email for contact info. Lastly, if you could please be praying. We are looking to figure out fund raising for associated costs not covered by insurance (such as travel room and board for the living donor), as well as contacting those who provide transportation services to transplant candidates and potentially the donor. I will be needing to go to Denver once transport is arranged, for the annual re-evaluation required to stay listed. Now that we are finally able to get "down and dirty" in this process, there is so very, very much to do. And homeschool still goes on. The summer I turned 13, Elvis died. I know this becasue I was working that summer for Paulette, the seamstress for our local dry cleaners and a huge Elvis fan. Her husband was in the FBI and never home, and her three boys made it impossible for her to work at home and, well, get anything accomplished. Other than curse and swear. So, I was hired to wrangle the boys - all three under 6 - in exchange for sewing lessons. For 5 hours, I managed to keep the house from burning down and the blood from flowing, and then for 2 hours she taught me how to cut, pin , mark and create. It was a really cool summer. Except for the day we turned on the TV to see the report that Elvis had died. Paulette sat down on the sofa there in the living room and bawled like a baby. When the summer was over, I left with newfound skills and her old machine. All through high school I sewed. Sarongs for the beach, pants, skirts and dresses. When I was ready to leave for college, there was a strict dress, or skirt/blouse dress code, so I knocked out my entire wardrobe. Fast forward to when my babies came. Material was bought, patterns purchased. And nothing was ever made. So, fast forward another 15 years. Kati begged for a machine but, we were hesitant to the length of time her excitement would last. She worked hard to earn the $100.00 for a basic Singer and we were in business. About this time, the new season of Project Runway started and she was hooked. Rather than buying patterns she first took on her closet, reworking eveyrthing she could find into something new. Some worked, some didn't. But, she kept trying. Now, to fuel her passion on a very limited budget, we scour the fabric racks the WalMart. They have a huge selection of fabrics for just $1.00 - $2.00/yard. which allows her about 2-3 years of fabric for almost anything. At that price, we can stock up and let her go. We discovered that every once in while they close out a ton of additional fabrics for $1.00/yard. The last time they did this, she cleaned up for $20.00. Don't get me wrong, this isn't the gross fabric that you wouldn't be seen it. She's gotten some silks, linens, cottons .. all in current prints. For patterns, she has discovered Burda offers free printable patterns. You simply print off the patterns, cut them out and tape together as needed. It's simple and free. With patterns now running $10 and up, it's a godsend. You can find many more sights like this by goggling "Free Patterns". So far, she's made pajamas, a hoodie, a couple of dresses and skirts- all for a fraction of what regular fabric and patterns would cost- let alone buying them at retail. For more Works for Me Tips, visit Shannon at Rocks in MY Dryer today!